One of the decisions new parents face is how they are going to feed their baby. With the choice between breast, exclusive pumping and formula feeding it can be an overwhelming decision. Each parent will make that choice based on a number of factors and the things that are important to them. All three of my children were bottle fed from almost day one. I fall into the category of being unable to breastfeed so opted to use formula for my babies. With Roo, Mr. Boo had to dash out and purchase bottles and a steriliser whilst I was in the hospital ready for when we were discharged home. With Tigger and then Piglet we had everything ready for when we were discharged home. Closer to Nature baby bottle sterilisers are designed to be fast, fuss-free and easy to use making it almost effortless to keep bottles, teats, and feeding accessories safe and free from harmful germs. A baby’s developing immune system needs to be protected. The Closer to Nature Electric Steam Steriliser is a chemical free sterilising system designed to kill 99.9 percent of germs on bottles. Sleek Design – the Tommee Tippee electric steamer has been designed to be sleek and oval shaped. Which makes it take up less space on your worktop but also appealing to the eye. Holds up to six bottles – It can be surprising just how many feeds your baby can go through especially in the earlier days. You don’t want to spend your life washing and sterilising bottles every five minutes so being able to sterilise up to six bottles at a time is fantastic. 24 hours sterilisation – if unopened the steriliser will keep the bottles sterile for up to 24 hours. Making it great to pop on before bed and unloading in the morning. Sterile bottle prep surface – the sleek design of the Tommee Tippee electric steriliser makes it easy to clean and store. Plus the lid can be flipped over to serve as a sterile bottle prep surface. Chemical free – having children makes you very much aware of all the chemicals that are used in everyday life. This set does not require any chemicals in order to sterilise the bottles efficiently. Easy to use – surviving on a lack of sleep can make concentration levels dip. No need to worry about trying to figure out how to use the Tommee Tippee electric steriliser, just push the button which glows orange and five minutes later you are good to go – it warms up and sterilises. Allow a few minutes to cools down before you use. BPA-free – All the Tommee Tippee Closer to Nature bottles are BPA-free for total reassurance. Closer to Nature range – Tommee Tippee has produced a wide range of bottles, teats, and accessories included within the Tommee Tippee complete feeding set. From different sized bottles to feeding teats and milk storage. 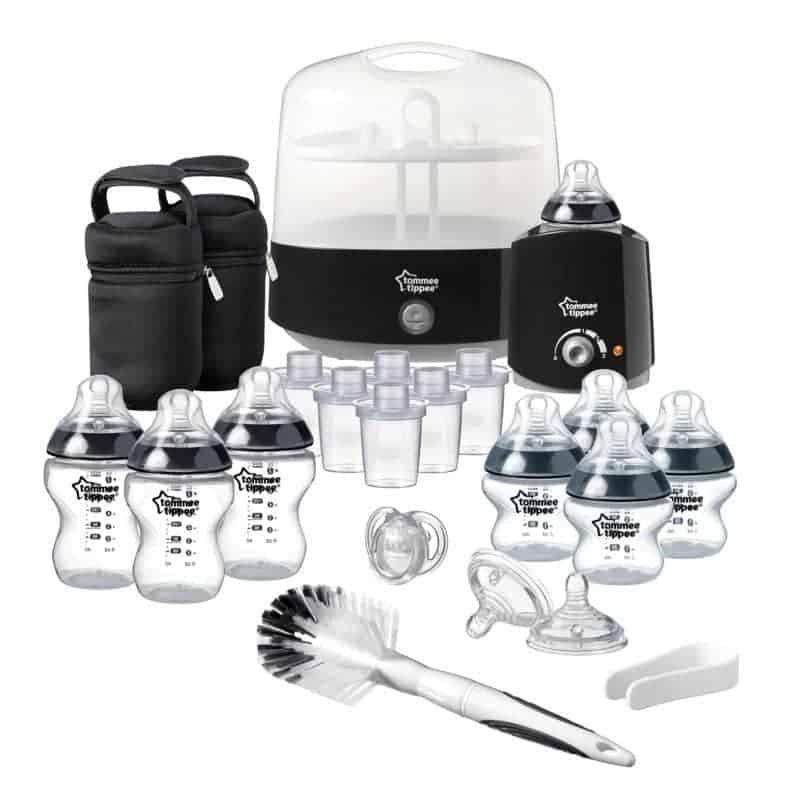 To help you get everything you need for bottle feeding Tommee Tippee has kindly offered us a Tommee Tippee Complete Feeding Set to giveaway to one lucky reader. I love Tomme Tippe products. Every kid of mine used their products while growing up! My daughter in law is having her first baby, they have been through so much to make this happen. Love tommee tippee. Used all tt with my little girl and will with all my others too!